The third home Armstrong designed and built for himself and his family. The house is divided as a "split-level". At the left is the double height space of the main Living Room. To the right the structure is on two levels: bedrooms above and kitchen, dining room, and carport below. 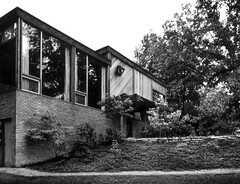 The large glass windows at the Northeast corner of the house overlook a private golf course.